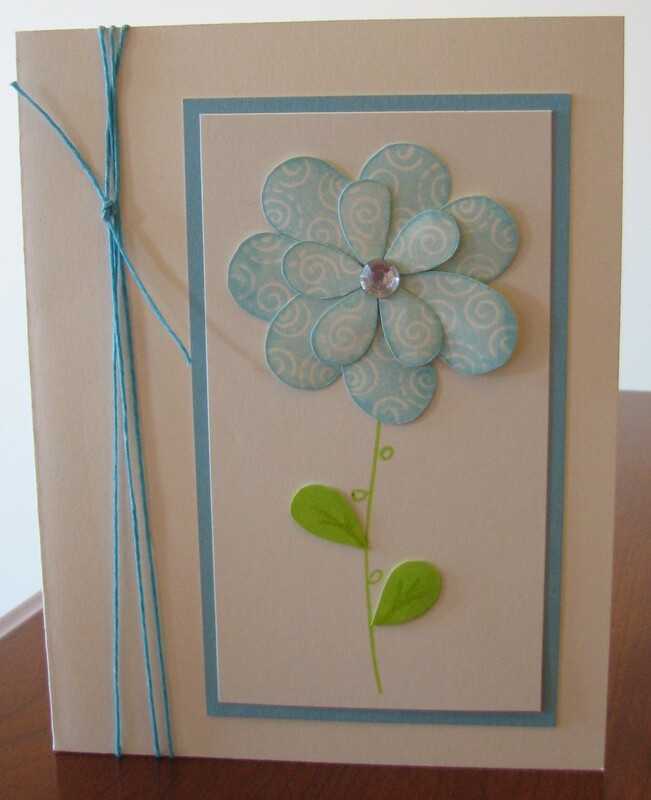 The challenge over at Scrap Our Stash this month is to use flowers on your project. Today I’m going to show you how to use stamps that you may already have in a new way to create some flowers and make the most out of your stamps! The first stamp I chose was a butterfly. It is very easy to transform butterfly wings into flowers. For those of you who are more visual learners , I took step-by-step pictures. 1. Stamp multiple butterfly images on scrap paper. 2. 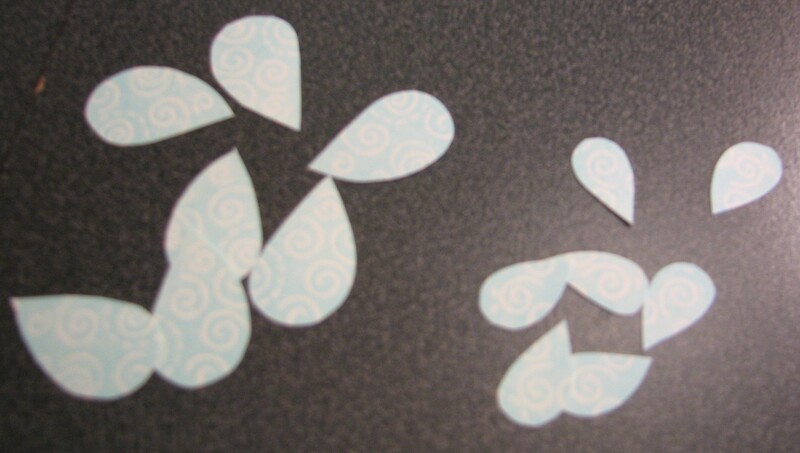 Cut out the butterfly wings, you can already see how they look like flower petals. 3. For this project I used another stamp for my stem. Flourish stamps also make great stems or bases for flowers. 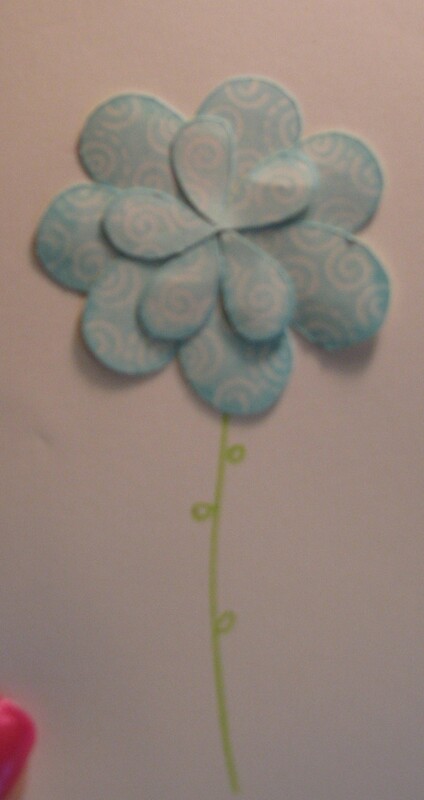 Next, I added some adhesive (a glue dot works well) to the top of my stem and added the petals. Just rearrange them until they are how you want and remember – flowers are not perfect so don’t sweat trying to make it look that way! Also notice that I inked the edges of each of the petals for more distinction. I chose to add both the small and large wings to my flower for a layered look but you could use them to create two flowers, a larger one and a smaller one. One tip when making your flowers is that it is important to work with an odd number of petals, guaranteed that they will look nicer that way. I used 7 for my large flower and 5 for the layer inside. 4. Last, I added some finishing touches and made a card. See those leaves? Did you guess that those are leftover butterfly wings? I just flipped them over and inked them green! Supplies used are all CTMH: Embrace Life Stamp Set, Crystal Blue and Sweet Leaf inks, Crystal Blue and Colonial White Cardstock, Crystal Blue Waxy Flax, Sponge Dauber, and Clear Sparkles. Other stamps that work well to create flowers are hearts and I’ve get an Easter Egg stamp set that is fun to use. If your not a stamper, diecut shapes and punchies work well too! « CTMH Customer Appreciation Sale! !